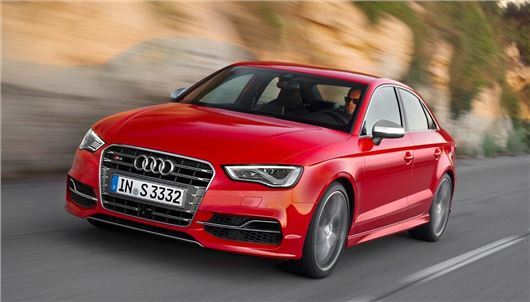 The new Audi S3 Saloon is now on sale, with prices starting at £33,240 and deliveries expected from March 2014. The Saloon will be the fourth addition to the S3 range, joining the three-door, five-door Sportback and Cabriolet models. The S3 Saloon will be powered by a turbocharged 2.0-litre petrol engine, with 300PS and 380 Nm of torque, which will be hardwired into Audi’s famous quattro all-wheel-drive. Official figures suggest that the Saloon will cover 0-62mph in just 4.9 seconds, before reaching an electronically restricted top speed of 155mph. Power will peak at 5500rpm, while maximum torque will be available from just 1800rpm. The four-cylinder engine can be pared with a six-speed manual or automatic S Tronic twin-clutch gearbox, with claimed fuel economy ranging from 40.9mpg (automatic) to 40.4mpg (manual). CO2 will be 159g/km, which equates to £175 for 12 months road tax. Audi has extended the car’s wheelbase by 35mm over the Sportback, which increases boot space by 50 litres to 390 and dual-zone air conditioning, adaptive cruise control and Bluetooth connectivity all come as standard, along with xenon plus headlights and LED daytime running lamps. The S3 Saloon will also get a number of design touches to tell it apart, with single-frame grille and front bumper, aluminium-look exterior mirrors and a platinum grey diffuser. The brakes also get S3-branded calipers. No trim details about trim levels have been announced as yet, but more information will be revealed prior to the car’s official UK launch in March.